Travel–especially international travel–can get tricky. But it doesn’t have to be. By train, by plane, by boat, or however you travel, we promise we’ll get you here stress-free. We recommend flying into Leon/Guanajuato Airport (code BJX). This airport serves all of San Miguel de Allende’s flight needs. It is about an hour and twenty minute drive from the airport to San Miguel de Allende, thanks to convenient airport shuttles. Once you’ve booked your airline ticket please contact https://bajiogoshuttle.com/ to book your shuttle. They will pick you up and get you to the conference quickly and easily. Your first day will be jam-packed with travel and breathtaking first impressions of San Miguel de Allende. You’ll want a siesta before diving into the city and the conference. Not sure where to take your siesta? 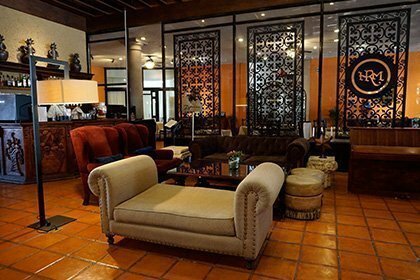 Real means “royal” in Spanish, and at Hotel Real de Minas, you’ll feel like royalty. Modern yet luxurious, these spacious rooms will make your stay as dreamy as your sleep. This location is extremely convenient to the conference; your only commute will be walking downstairs! We’re excited to host the forum in the Hotel Real’s exquisite conference rooms. Affordable yet comfortable, Hotel Posada de las Monjas boasts a view that’s sure to relax your senses. You’ll experience a lovely patio, friendly service, and an authentic experience at this historic hotel. This location is a quick fifteen-minute walk from the conference location, Hotel Real de Minas. (We’ll also run shuttles each day, if you’d rather ride). 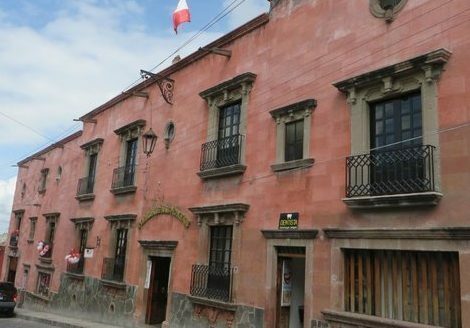 If you want to explore the city, Hotel Posada is a perfect choice–you’ll sleep right in the heart of the town, close to the city square. While there are other accommodations available within the city, these are our top picks. We believe they’ll give you an experience that is comfortable, convenient, and reliable. You’ll come for the conference. But you’ll stay for the city. Our city, the beautiful San Miguel de Allende. Historic yet charmingly cosmopolitan, it’s no surprise that UNESCO named San Miguel de Allende as a World Heritage Site. Explore cobblestone streets to wind your way through a wealth of shops, restaurants, museums, and more. Here, history, art, and lifestyle meld into an incredible atmosphere that’s second to none. Visitors often boast that San Miguel de Allende is the safest city they’ve visited. That, paired with the vibrant culture and lively atmosphere, is why San Miguel de Allende was voted the best city in the world for the second year in a row. San Miguel has something for everyone. Curious to hear the city’s history? Tour local landmarks, from the Ignacio Allende House to the San Miguel Arcangel Parish. This cathedral-like parish is the city’s most striking landmark, located in the city square. Pink pastels sweep the sides of the building’s soaring architecture. Its exquisite interior will leave you breathless. Or head to Galeria Atotonolica, an exotic collection of Mexican folk art. You’ll see rich ceramics, vibrant textiles, dazzling mosaics, authentic sculptures, and so much more. Each piece brings the history of San Miguel to life. Hungry? Put some “wow” in your mouth at local restaurants as you discover authentic Mexican cuisine. But what’s better than eating authentic food? Learning how to make it! San Miguel’s local chefs at cooking schools like Sazon or La Cocina will immerse you in the rich culture of Mexican food. Tour the city market to discover local ingredients, and learn the lore that surrounds how people have eaten through the centuries in San Miguel. The best part? You can relive the experience at home, too–you’ll take some recipes home with you. Favor the nightlife? Kick back at a local bar–or more than one (there are lots to choose from)! You’ll experience live music from passionate local artists. Sample delicious drinks with a Mexican flair, from margaritas to tequilas to mezcals. Enjoy a nightcap, smell the night air, and stroll the moonlit cobblestone streets. Need other ideas? Check out all San Miguel de Allende has to offer.